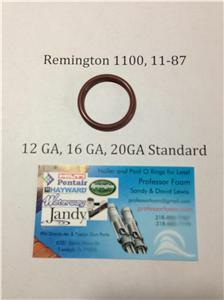 Home» Products» Remington 1100, 1187, 11-87 12ga Barrel Gas Seal, Viton O-ring LOWEST COST! Remington 1100, 1187, 11-87 12ga Barrel Gas Seal, Viton O-ring LOWEST COST! 1 new aftermarket Black or Brown Viton Gas O-rings for the Remington 1187 and 1100 12, 16, 20 gauge standard. You will receive 1 O-rings that will fit 12, 16, 20 gauge for $1.45!! Quantity available shows how many sets of 1 are available for sale.